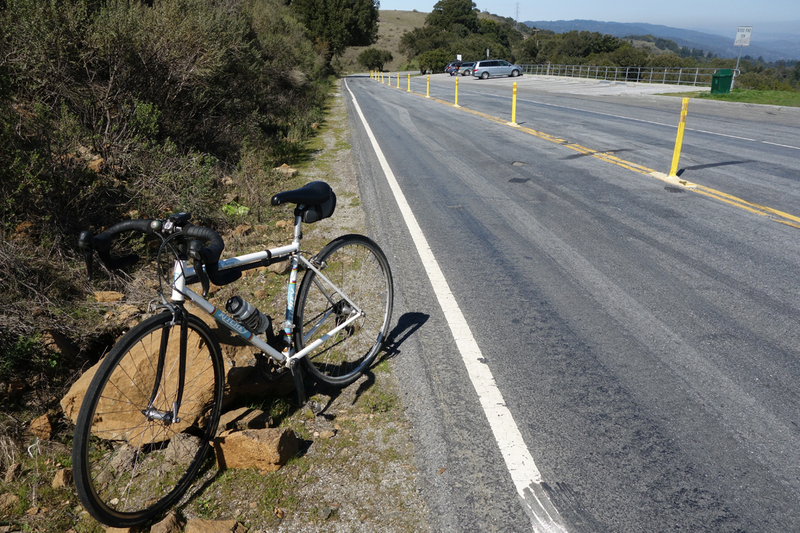 Skyline Boulevard repair is almost complete about a mile southeast of Page Mill Road. 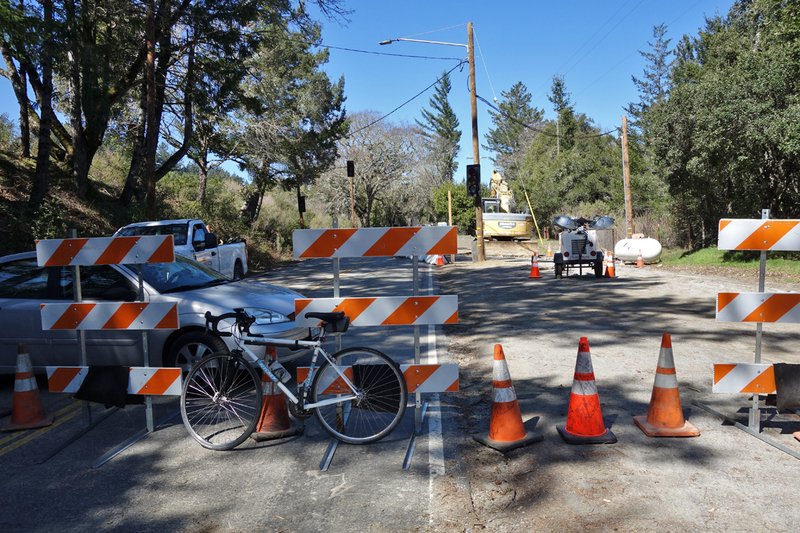 Skyline Boulevard, closed since February 4 due to a road washout 5 miles northwest of Highway 9, will open on Monday, April 18, or thereabouts. I checked it out today. The road had just been paved. It needs time to settle and the crews need to clean up. It sure looks like the newly repaired road is narrower. Steel beams reinforce the downslope that washed out and undermined the road. I’m not sure if the traffic signals were there before the repair. It makes me wonder if this is a temporary fix with a one-way traffic light. It might explain why the road is so narrow. 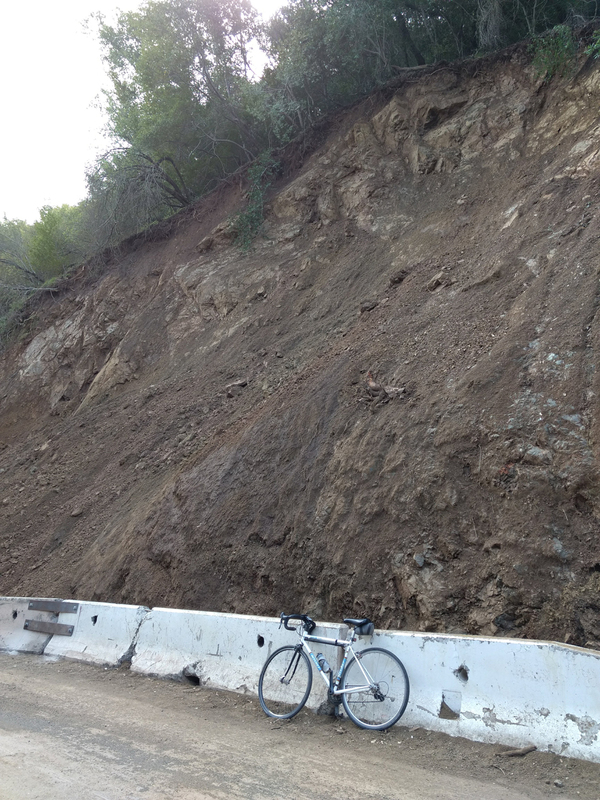 Skyline Boulevard closure. Note the traffic signals. If you want to visit the site, you can. Skyline is only closed where the repair crews are working. There’s access to a MROSD trail that borders a Christmas tree farm on the south side. Look for a locked gate before the road closure. The gravely dirt road has ups and downs for a quarter mile. Hicks Road slide has a temporary fix. A half-mile south of Shannon Road. Anyone who has ridden up this road knows why I call it “Horrible Hicks,” besides the simple alliteration. The road suffered a slump in recent rains, bad enough that the county had to put up a mobile LED warning sign. By the way, if anyone is missing a hubcap, there’s a whole bunch of them next to this slide on what appears to be another slide. Maybe the caps were on someone’s property higher up and they slid down the hill. The slide is about a half-mile south of Shannon Road. Newts enjoying life in Almaden Quicksilver park. 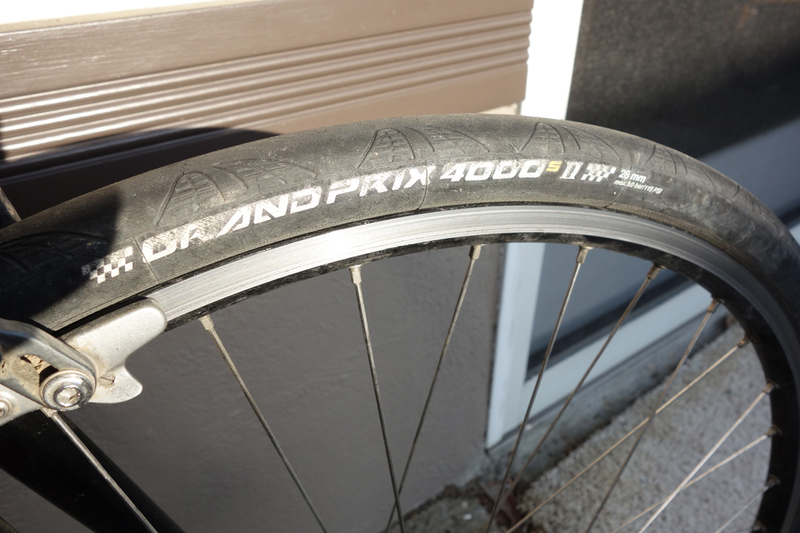 What do newts and cyclists have in common? They get run over by cars. Anne Parsons can tell you about newts and the death toll on Alma Bridge Road overlooking Lexington Reservoir. She’s at 2,695 and counting. The San Jose Mercury News ran a story this morning. Her website records every death in sad detail. 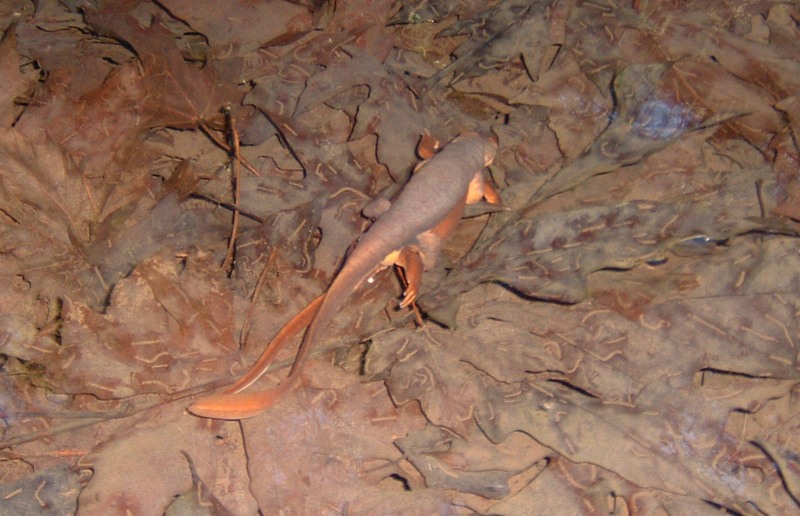 On my bike rides through the Santa Cruz Mountains I’ve seen thousands of dead newts during the wet winter months. They’re also dying in great numbers on Hicks Road. What can we do about it? 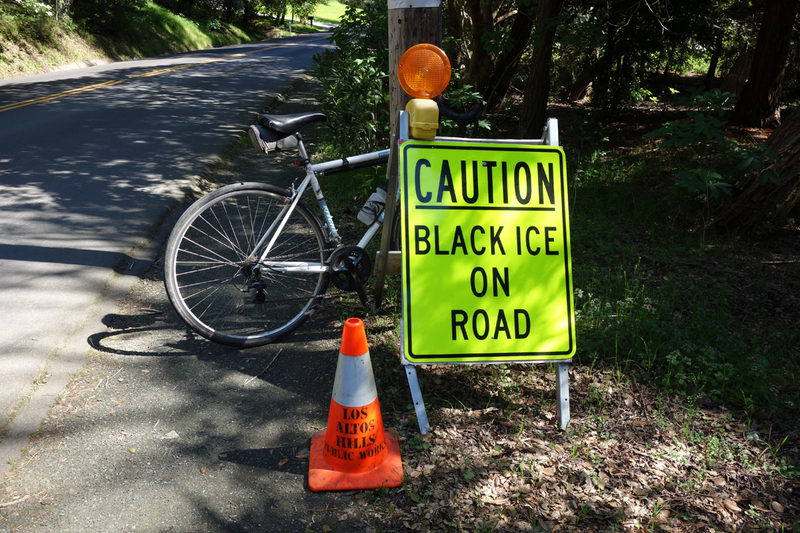 In Tilden Regional Park, they close South Park Drive every winter. That would be a drastic measure on Alma Bridge since local residents use the road. I had intentions of recording and posting every cyclist death in the U.S. this year, but after a week I gave up. It’s too depressing. The one hopeful thought that comes to mind is a wildlife corridor. They’re being employed around the world in greater numbers. One of these days there will be one under Hwy 17. 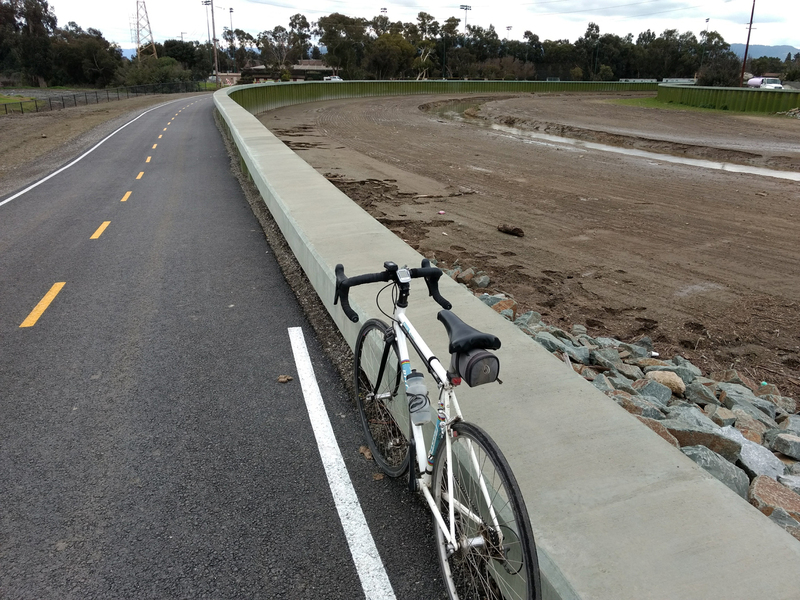 The Bay Trail at San Francisquito Creek in Palo Alto has reopened. 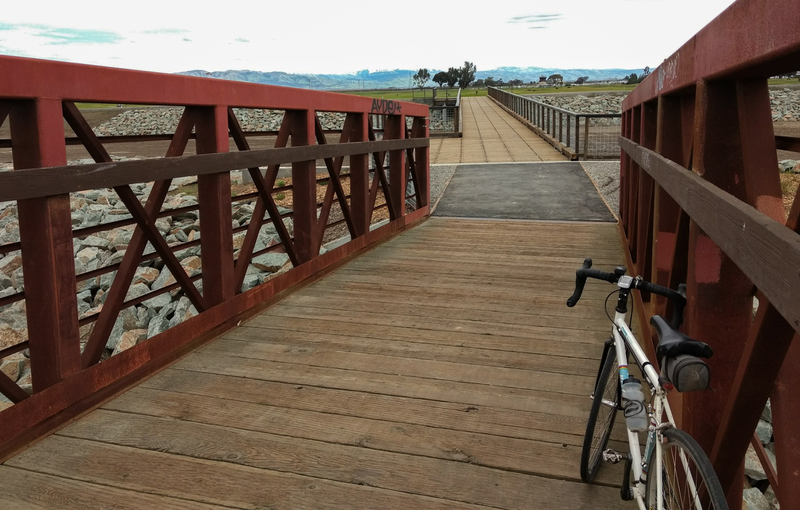 A key path linking Palo Alto to Dumbarton Bridge opened last December, which is good news for cyclists who like to visit the East Bay parks. The San Francisquito Creek Joint Powers Authority invested $76 million widening the creek, repaving the path that connects to Geng Road and adding a new Friendship bridge. The path that was replaced is only a half-mile long. While you may think it a waste of money, it’s one of those public works projects that will pay for itself after the first flood. The normally placid creek occasionally spills over its banks and wreaks havoc. The wall and widening will help contain the floodwater. Once over the bridge, the old path wasn’t repaved into East Palo Alto. Landscaping will probably be done later this year. Friendship Bridge leading into East Palo Alto has been repositioned and lengthened. If only I could have been around for bike riding when the NAC map — previous posting — was published in 1939 (it mentions the Golden Gate International Exposition). No traffic, except on heavily traveled roads like Hwy 17. Hwy 35, Skyline Boulevard was Hwy 5. 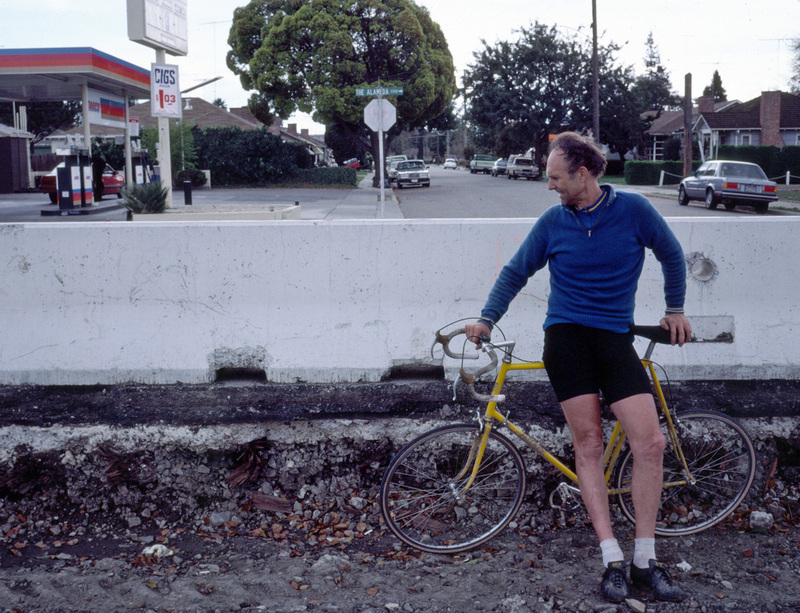 The number changed in 1964 when California renumbered all its roads. Portola Redwoods State Park did not exist. The parkland was owned by the Masonic Lodge, which sold it to the state in 1945 to create the park. Bear Gulch Road between Woodside and Hwy 84 is not shown. Pomponio Road is shown extending to Pescadero Creek Road. It could be ridden today, but it’s private property and well protected against intruders. Moody Road is shown, but not named. The road that extends to the west from Moody goes through Foothills Park and connects to Los Trancos Road. There was a quarry there back in the 1940s or so. I rode it once or twice back in 1979. 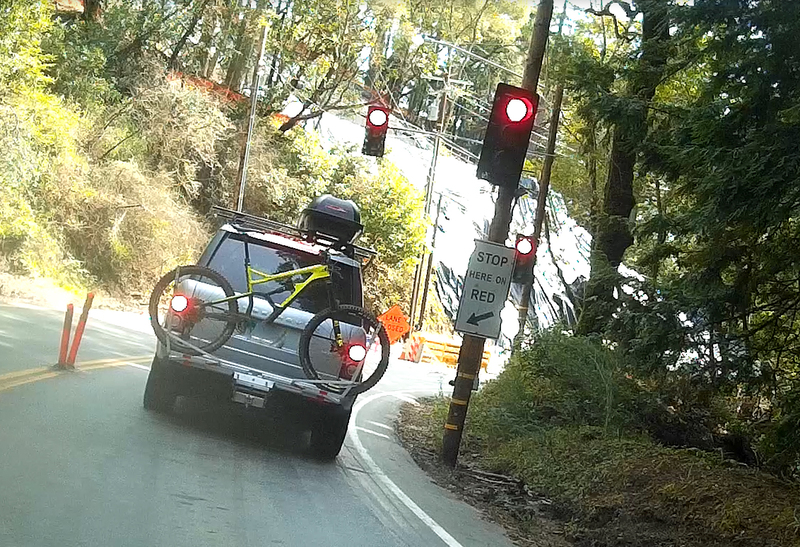 I’m not sure about the roads going through Los Altos Hills. 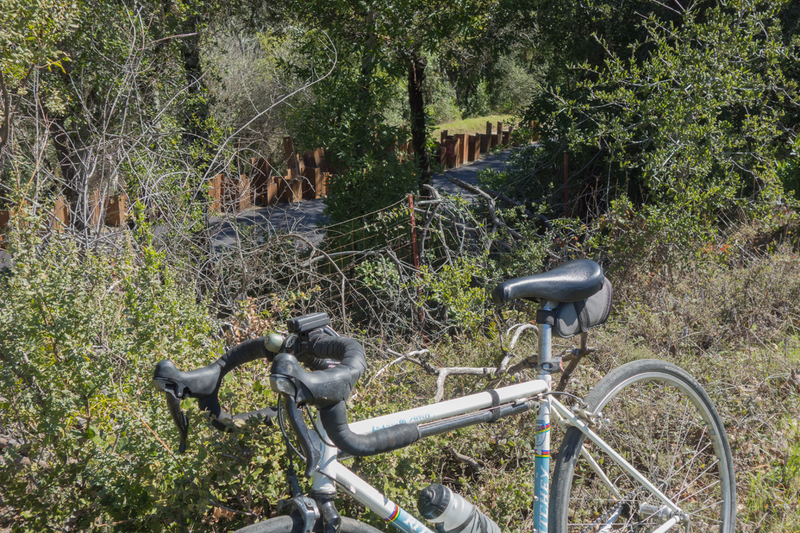 There isn’t a road that goes through to the east of Arastradero Road off Page Mill Road. Maybe one of those is Elena Road. No reservoir is shown at Stevens Creek. It was built in 1935. Skyline Boulevard is shown as under construction south of Hwy 9, although it was widened by 1932 so maybe this map dates that far back. Here’s a good history of Skyline Boulevard. Money ran out and there was no agreement on where to extend Skyline south of Black Road. Tracks of the South Pacific Coast Railroad (later Southern Pacific) are shown extending south from Los Gatos. Montebello Road and Stevens Canyon Road are depicted, although Stevens Canyon Road is not shown going to Page Mill. Soda Springs Road is shown going to Mt. Umunhum, but the mountain is not named. Loma Prieta Road is not shown, although it existed in the 1930s. Highland Way continues down Redwood Canyon Road, which does not exist today. That looks like Ormsby Cutoff connecting to Grizzly Flat Road, or some variation. Castle Rock State Park is not shown. It wasn’t declared a state park until 1968. Highway 236 is not named. It’s part of Hwy 9. I don’t know when the name changed, but the route was paved around 1928, along with Hwy 9. 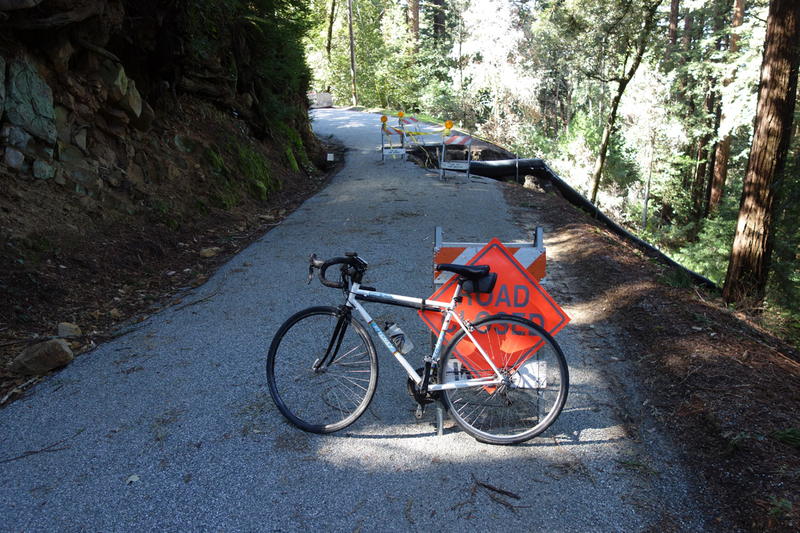 There was a strong desire for a better road for access to Big Basin Redwoods State Park. NSGW Park is shown off Tunitas Creek Road. That was Native Sons of the Golden West park and campground. The fraternal organization’s property was private, as far as I know, and no longer in operation today. 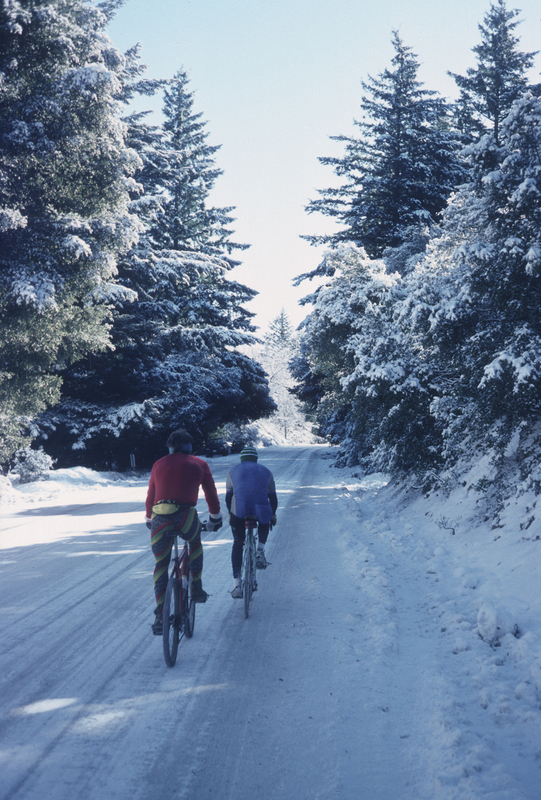 We used to ride our bikes on Native Sons Cutoff to reach Star Hill Road. The area has changed a lot over the past several decades, so the roads I knew are not the same today. Congress Springs is named on Hwy 9. There was a nice hotel and mineral spring starting in 1866. An electrified light rail ran up the canyon from Saratoga to the hotel. 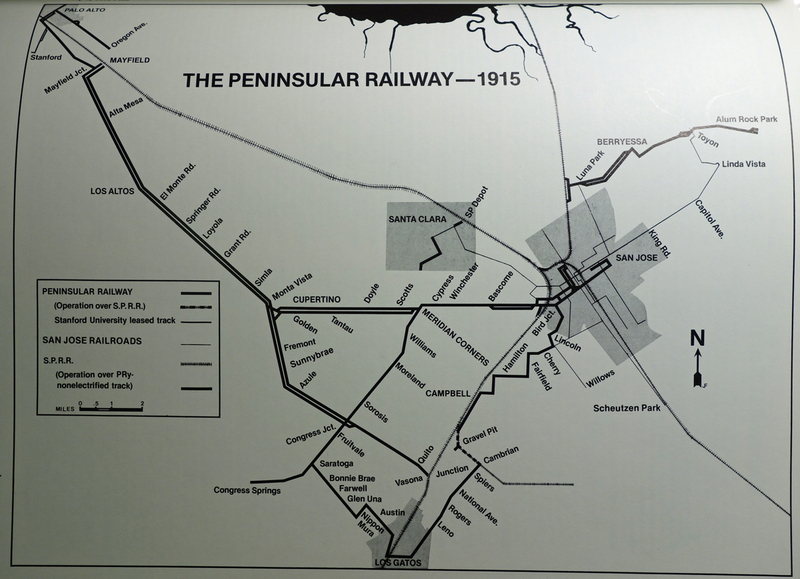 The hotel burned down in 1903 and the Peninsular Railway was abandoned. I tried to find the mineral spring, without success. Speaking of Hwy 9, this road was built to Saratoga Gap summit in 1865, called the Saratoga and Pescadero Turnpike. It was completed down into San Lorenzo River valley in 1871. Parts of the original road are still usable for hikers on “Toll Road” trail paralleling Hwy 9 on the east (Castle Rock) side. Santa Clara County bought the road in 1880 and called it Congress Springs Road. You don’t know what you’re missing until you know what you’re missing. 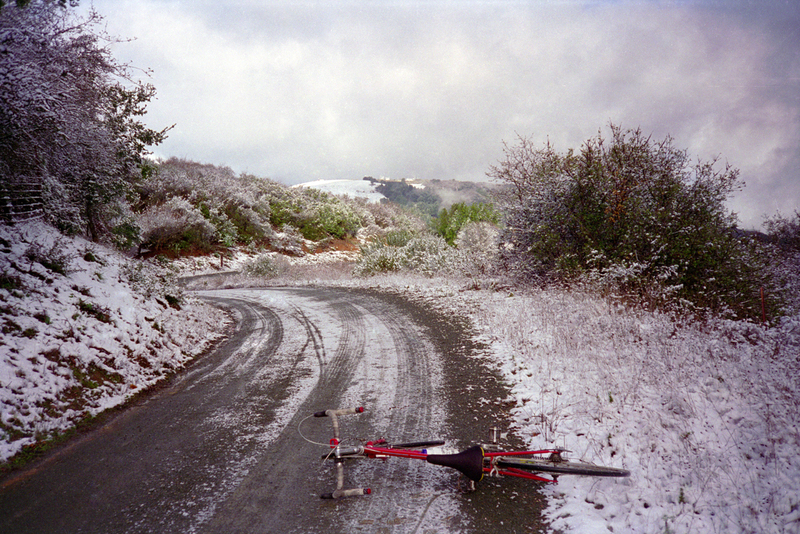 Alpine Road, December 30, 1990. See it and weep. Old Cañada Road is shown on the map, extending to hwy 92. 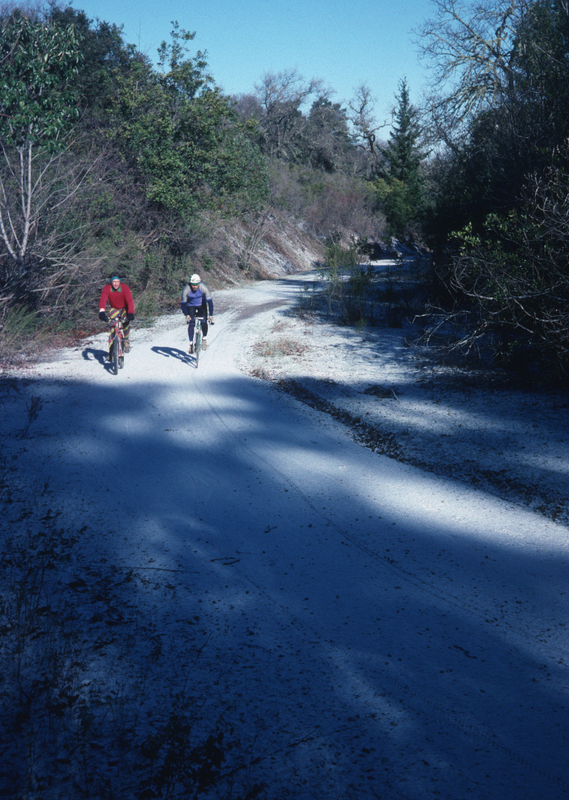 Upper Montebello Road with snow in 1994.